This blog serves to understand painting and color in a more in-depth way. Enjoy! What is a Paint Sheen and Why Does it Matter? Should You Paint Before You Move In To Your New Home? Wow, so you just bought a new house and its beautiful and you're super excited! There's just a couple things you need to do before you move in, and one question you have is, Should I Paint Before I move In? We would recommend it, for sure! Behr 2019 Color of the Year! 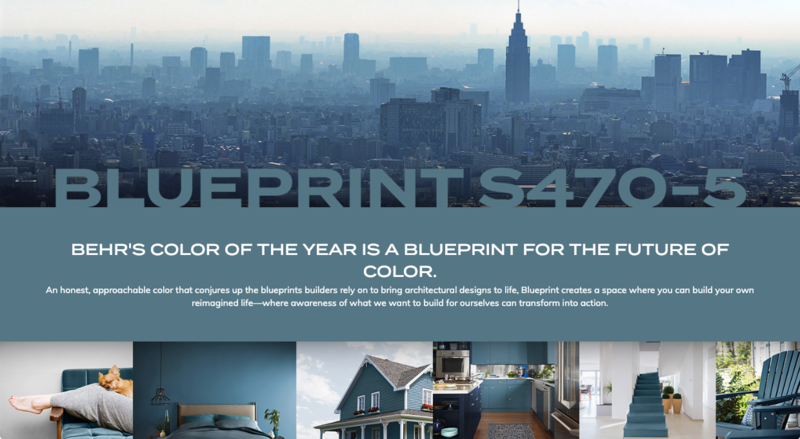 Okay, All the big guns come out with their predictions of the Color of the Year and this year, Behr is coming out with theirs: Blueprint S470-5. It's similar to the Color of the Year last year from Sherwin Williams, which was Oceanside, but the color sets are very popular which ever company you choose to use. We would love some feedback from the public as to what they think about the Behr Color of the Year. If you would like to leave your comments below, we would love the feedback. Can You Paint Your Exterior in the Winter? The quick answer is yes. However, there are caveats. The temperature must be right, or the paint will fail. If the temperature is too low, below 45, it gets really sticky, no pun intended. The temperature of the air is important but also the temperature of the house. Both have to be above 45 and not just for the application of the paint, but the drying process as well. Sherwin Williams 2018 Color of the Year! Every year, Sherwin Williams names their color of the year. It's inspired by different components, different ideas and mostly does its best to inspire people to be BOLD and DARING. This year, Sherwin Williams chose "Oceanside" (SW 6496)! Selling a home is a big deal, it's one of the biggest, if not the biggest purchases you've made in your lifetime and when you want to sell, you want to maximize what you can get for it. Take it from us, a bi-partisan player in the real estate market. In our experience over the last 13 years of business, we have experienced a higher and faster percentage of sale after realtors have used H3 Paint to come in a help out with some color and fresh wall paint. It applies to both interior and exterior color changes. In this latest example, Bryan Hubbell, Exit One Realty, requested that we provide his client with a free no hassle estimate to paint their home, which is for sale. After providing the quote and viewing the home, we were informed that the biggest draw back for potential buyers was the color of the exterior. Being a painting company, we totally understand this dilemma. Certain paint colors can be off putting to some and create an inability to look past it, serving as a blockage to being able to move forward with viewing something that otherwise might have been a close to perfect home. Every once in a while we get a client that requests something special. This time it was Baby Birds. This particular client had a special request, save the bird nest and baby birds that were at the front porch. We honestly had not had this request before. 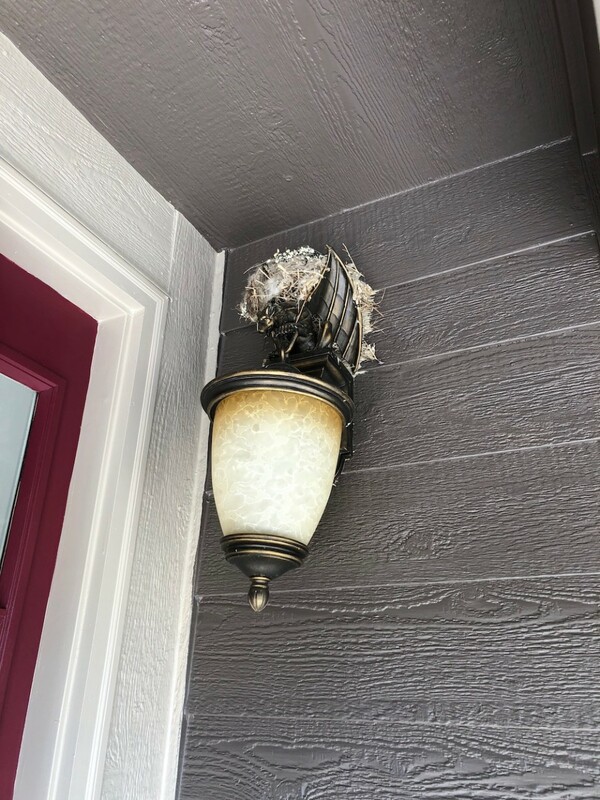 Usually a client will ask us to clean up and remove an old abandoned bird nest, or wasp nest (we have not yet received a request to save any wasp nests!) so that we can paint and seal the home properly. We knew we had a challenge. When spraying the paint onto the surface of the home, there is inevitably overspray that occurs, even a small amount and although we try and minimize this, it happens and if this overspray were to cover the bird nest and or get on the baby birds, the mother would most likely not return. And yet, we could not touch the nest or again the mother bird would not return and the baby birds would not survive. To make matters worse, the mother was hanging back from the nest while we prepped and painted the home, so we were already on a time limit! We devised a way that we could wrap the nest with a thin film of 3M plastic while we sprayed as close as we could without causing any trouble. Then we carefully removed the plastic wrap. The birds were still safe. Next we let the body of the house that had been sprayed, dry out. Last, we carefully hand cut the trim and siding around the birds nest. We were careful not to touch the nest at all. Im happy to report that the mother bird came home every night while we were on the jobsite. She seemed to watch from afar as was reported by the homeowner. The baby birds are safe and all is well. 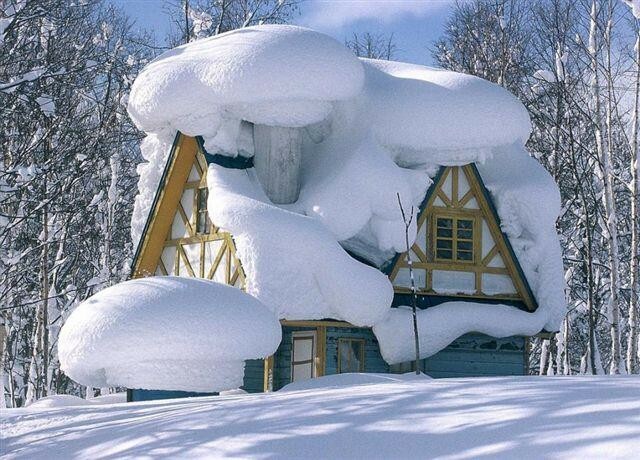 Most of us living in Colorado know that with our 4 seasons, the weather can be harsh on our homes. During the winter seasons temperatures can reach far below freezing and then the summer heat can reach above 100. Thats quite a difference between temps! So, now you ask yourself, where am I going with this? Well, all of those climate changes in our beautiful state of COLORado produce moisture. 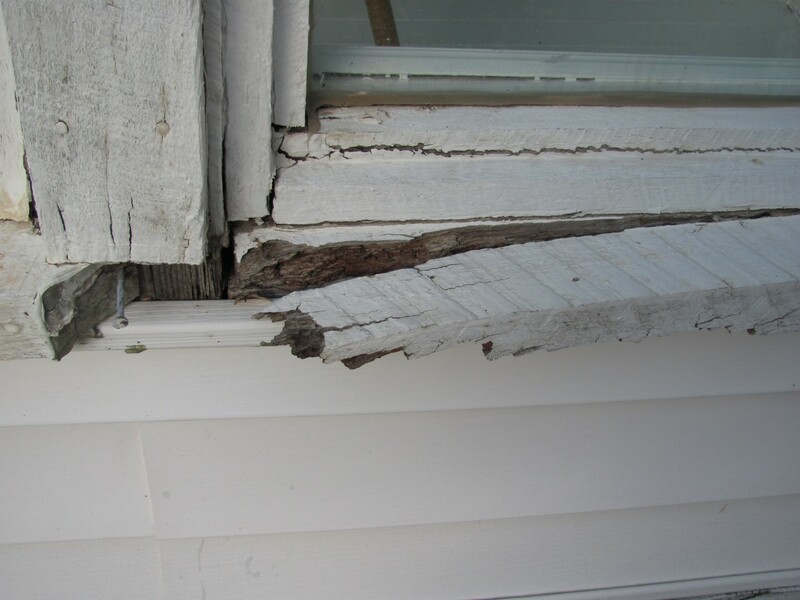 This moisture can wreak havoc on your home and here's how.  6 Reasons Why Hiring A Professional Painter Is A Good Idea! Hiring a professional painter can be challenging when there are so many to choose from, why not just do it yourself? In this article we will describe the benefits of "doing it yourself" versus hiring a professional painter. Are we biased, no way, it's just the facts ma'am! The coating of paint on your home's exterior is the first layer of defense against our harsh Colorado weather! You know the saying, "If you don't like the weather, wait 10 minutes!" With the extreme hot and cold that we Coloradans experience, having a solid coat of quality latex paint paint on your home's exterior is key to keeping your house protected. Okay here are the top reasons to get your house painted in the Spring! How is it, that painters can create perfect paint lines? More often than not the answer is caulk and tape. But that’s not the whole story and it’s not the only answer. A very good brush and a steady hand can create perfect lines. Very good brushes, for example, are Purdy brand brushes that are 2.5” with an angle for cutting. For taping and caulking, you must have the correct tape and the correct caulk and then you have to follow the directions. Why Hire a Color Consultant. Save money. A color designer will help to pick the right color to avoid costly mistakes with color or paint products.Save More Money. A color designer will often get discounts on paint and painting supplies and can pass that savings on to the client.Creative choices. A color professional can suggest colors, placement, sheens, and decorative finishes that are unexpected and out of the box. Your home will have a custom feel.Product Knowledge. A color designer will have expert knowledge of paint and products and be able to suggest the correct products for your specific job. Color sells. Professionally color designed homes can sell faster and for more money.Big Impact. Color is the most effective way to completely change the feel of your home, it can rejuvenate old spaces and enhance forgotten beauty in your home. Who said in the nineties that peach and light teal were going to be the hot trend? How come you can see specific colors and it evokes a memory of a certain time in history. Colors come in groups, they are sold to us in a package, if you walk through a department store you can see certain colors that are prominent in fashion, home decor, paint, and any imaginable item one could spend money on. For example a few years back sand-colored tans, rich chocolate browns, and robin’s egg blues became very popular in everything from dishes, skirts, baby bedding and office supplies. I was enamored by this color scheme and had pillows, rugs, and paints with this scheme and wore these color religiously. This is when I first realized the degree of influence the color marketing groups have on our day to day purchases. When this small and influential group of people determined these were the colors of the future they then informed the dye makers, paint industry, and anyone who wanted to be on what seems like the cutting edge of color. When I saw this trend so strong in all aspects of our lives it made me think about color combos of the past and more importantly color stories that were going to be given to us for the future. I researched trends and looked for what fashion gurus and influential designers were talking about and what I heard over and over again was all about smokey grays and sunny yellows. I immediately fell in love, like a sucker I was hooked, and decided this was how I wanted to redo my own master bedroom. I shopped online and looked everywhere I could think to find these colors in linens and decorative items but it was not to be found anywhere. My only option was to settle for colors that were not quite right or make custom pieces. If only I had waited for 6 more months I could have bought exactly what was in my minds eye and even found it at discount stores like Target. During our estimate process we speak with you to understand the full scope of your needs. We discuss what rooms or walls need to be painted or what part of the exterior of your house needs to be painted. Select a blog entry All About Paint Sheens Should You Paint Before You Move In To Your New Home? Behr 2019 Color of the Year! Can You Paint Your Exterior in the Winter? Sherwin Williams 2018 Color of the Year! Your Request has been Granted! Nick and Mike Erie, Co.
"I am writing to recommend the services of H3 Paint. Katy and Chis, the owners, were very professional and accommodating to all of our requests. Katy did a great job helping us choose colors and they actually came to the office several times to put samples on our walls. 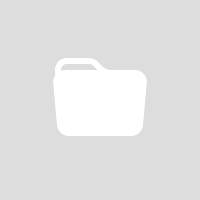 We are a busy Dermatology practice, and we see patients six days a week. Chris and his team painted at night and on the weekends, and did an excellent job! They were punctual and communicated with me on a daily basis. Their bid was very comparable to other bids I received and the final result was amazing! Our patients continually comment on how nice the office looks and how much they like our colors. We had one patient that wanted the name of one of the colors to use on her own home! Overall, Katy and Chris did an outstanding job and I would highly recommend their interior painting and color design services." "What a great company. Not only Tim, the owner but his wife, who helps pick colors, and his staff of painters- all were polite, friendly and hard-working. Willing to go the extra mile. Project was done ahead of schedule." We are happy we chose Tim and H3 Paint to repaint our 2-story in Erie. Despite the challenges of scheduling around weather, and last minute homeowner requests, Tim, Jake, Jesse and the added crew finished the job in the time frame promised. The crew did not finish up on site until we had walked and inspected the job several times. Everything about the final product is flawless in our opinion. Tim and H3 provide other construction services besides painting, and we are having them come back for another project we are doing. We will definitely contact Tim for any household projects or renovations we have going in the future. Tim and his guys did a fantastic job!! When he came over to do the estimate he was upfront with what all the charges would be. He was very knowledgeable and he made sure to explain everything that they would be doing. When they came to do the work they made sure that they let me know what they were doing every step of the way. Everyone that worked on my house were very nice and great workers. They did a great job matching the paint color that we had on the walls. They worked very efficiently and they finished the project in the time he originally told me. When they were done they walked me around to all the rooms they painted and made sure that I was completely satisfied with their work and I definitely was pleased! If you are looking for an honest, affordable company to complete your project then I would definitely recommend choosing H3 Paint. They are one of the best companies that I have ever had help me!!!!!!!! I will DEFINITELY use them again!!!!! I can't say enough about H3 paint and their exceptional customer service, attention to detail and flexibility in a project that had a lot of moving pieces. Tim was quick to come out and assess the project on short notice. Weather and scheduling issues with other trades made getting Tim's guys on site a challenge but Tim was understanding throughout the entire project and had a team on site over the weekend so we could maintain our schedule. The homeowner loved the finish project and I will definitely be using H3 Paint on all of my future projects! and you should too! H3 Painting saved the day!!! I was at the tail end of a bathroom remodel from hell that seemed to be never ending. I hired H3 to paint my bathroom only to find that there was a large gaping hole in the wall that the previous owner of the house covered up with a decorative mirror. Sigh. Luckily, H3 brought in a drywall guy to fix the hole and then followed up with painting. Finally my bathroom is complete! Their prices are more than reasonable and they use an invoice system that allows you to pay online with a credit card which I greatly appreciated. Thank you, Tim and Katy! Tim came out to do an estimate for our home which included vaulted ceilings and some complicated color decisions. Once we received our estimate back and saw that the prices were reasonable, their color consultant, Katy, came to our home and worked with us on the what colors would work the best. My husband and I were at odds over the exact color, but she knew how to find the right balance between both of our color needs, to find our perfect color set for our home. We couldn’t be more pleased with the outcome of the colors, speed of the crew, and the professionalism of the entire company. We highly recommend H3 Paint for all of your painting needs. Katy and Tim go above and beyond making sure the customer is happy. They helped me get through a nightmare situation with my HOA and worked with me when the HOA decided my colors were 'offensive'. Through it all Katy was behind me cheerleading! This went on for months--and she always managed to make me feel like I was fighting the good fight and that she really cared what I was facing. Their employees pay attention to detail and are mindful of what the home owner wants--regularly checking with me to come out and take a look. Do I like what I see? It was great to have my choices validated. I would recommend calling H3 Painting for your painting needs. Why waste your time calling every where else? Their prices are reasonable, their service and dedication is impeccable and they care. What more could one want? Thanks for making my house--the house everyone wants! We were extremely pleased with the attention to detail and workmanship that Tim and his crew provided. Tim kept us informed daily on their progress. We appreciated all the time his color consultant spend with us picking out colors. We would highly recommend his company to our friends and neighbors. It can be so hard having people in your home but this was not the case with the H-3 Paint Company. Katy came first and gave us a bid and when we accepted her very reasonable price, she came over &assisted us with paint colors. She has an eye for color that is amazing and I am so happy with every color she picked. She helped on both the interior & the exterior colors. The painting crew lead by Tim was polite, efficient & respectful of our home. This was my best experience on every level with painters in my home. Now they get to come back and do my office - yaaay H-3 Paint. Excellent customer service and work. Cannot recommend Katy and Tim highly enough! From start to finish H3 was wonderful to work with. Wow, wow, wow! We recently hired H-3 paint for an extensive project. They came out and we're so friendly and professional. I couldn't be more happy with the work they did. I highly recommend them! The team did an incredible job painting our office! © 2017 by H3 Paint. All rights reserved.